Use Thermo Scientific™ RA Lamb Top Covers for standard size Slide Filing Cabinets. Available in a variety of colors. 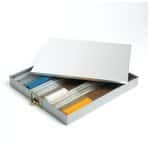 Hold a combination of microscope slides, tissue cassettes and 35mm slides in one cabinet with the Thermo Scientific™ Modular Filing System. Customize storage with Thermo Scientific™ Paraffin Block Cartons, available in multiple storage capacities. Made from white cartonboard and compatible with 1250 Paraffin Drawers. Simple filing of up to 1500 blocks. 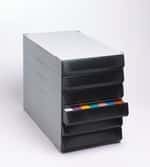 Thermo Scientific™ Block Filing Cabinets feature smooth sliding action and rigid construction. 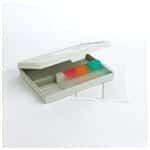 Store up to 240 slides with Thermo Scientific™ Microscope Slide Trays. 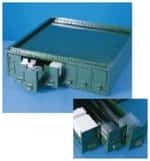 Store up to 100 microscope slides with these slide trays and racks. Raise a stack of standard size cabinets off the floor with this base stand for the RA Lamb LabStack Storage System. 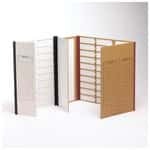 Separate slides while drying with these spacers, available in several varieties. Slides fit into slide filing cabinet drawers. Store up to 48 75 x 26mm (3 in. x 1 in.) microscope slides in these cardboard folders. 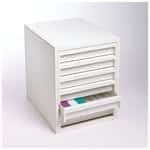 Permanently store up to 165 embedding rings or 250 cassettes per drawer with modular cassette storage drawers. Store and organize up to 100 slides in this storage box. Store materials long-term with color-coding and convenience using the Thermo Scientific™ ColorStack Replacement Drawers and Archiving System. Allow for for the storage of 76 x 26mm slides with Thermo Scientific™ RA Lamb Drawer Dividers, for use with seven-drawer cabinet drawers. Identify the location of slides removed from cabinets with detailed Thermo Scientific™ RA Lamb Slide Filing Location Slips. Hold up to 5000 standard 3 × 1 in. (75 × 26mm) microscope slides in the Thermo Scientific™ Stackable Slide Storage Cabinet. Finished in beige baked enamel and complete with drawers.